As promised, here are the Kyou and Maya Append Scenarios. Because my MEGA account got nuked, I decided to include the entire patch in this download. That means you’ll probably have to download some stuff you already have, but it was a bit of a pain to figure out what exactly was new and what wasn’t. Even if you already had our previous patch, please make sure to extract all files from the patch to the Hatsukoi folder, otherwise the appends will not work. As for what’s next, you might have seen Triplicate’s twitter or our posts in /vn/, but if you haven’t, we have decided to re-read and change some lines of the early parts/routes in Hatsukoi. Trip never was too happy about our earlier work, and he has always wanted to go back and redo some of it. The “early parts/routes” refer to at least the Common route, Midori route, and Runa route. We haven’t yet decided if we’ll re-read Kyou’s route as well. Let me be clear. We will not be re-translating those routes. We’ll both be re-reading them, and make changes where we deem it to be necessary. Of course, this will take some time, but we want to make sure the quality of the first few patches is up to par. Release the TLC+Yukino Append patch. I won’t be bothering with update posts for the TLC and the Yukino append, so the next post will be the TLC/Yukino Append patch. Man, what a ride. I can’t believe Hatsukoi 1/1 got picked up and translated after coming back to play VNs again. I was going to start playing it now when I just saw this post, amazing. Thank you for your hard work, looking forward to Yukino hopefully soon! Thank you for your hardwork again and I am looking forward to read Kyou and Maya Append Scenarios. However I am really looking forward to read HoshiOri. Finally a dream comes true, I always wanted to read it but no english company want to localize it and there were no fan-translation. Therefore I am really happy that you guys are going to translate HoshiOri. I should have copied the signusengine from the patch didnt i? so the old one is cracked? You should reinstall game. Just in case backup your saves, they should be in documents/toneworks/hatsukoi. Then extract all files from patch to game folder. Well i was able to make it work although now its asking for a disk. i need to redownload the game . Thanks for your hard work. really appreciate all the hard work you’ve done guys. Great! Thank you so much for the update. hoshiori is next. as it´s a rather longish title monobeno might or might have not gotten an official localisation until then, provided they´d be interested in doing it that is, which i´m somewhat heavily doubting. Why when i copy the patch there is nothing changed? Does anyone know if they are planning to translate Virgin Road? We won’t, as we’ve said multiple times on this blog already. Right, my bad. I just read a recent blog that heavily implied it and I sort of understand some of the frustrations, guess I just wanted to see what the new routes would be like. Thanks for the hard work. Thank you so much for translating especially image editing where big TL companies fail miserably. Thanks for taking the time to translate the append! Im confused on maya append though, does her append happen after her route in the kissing booth or is it an alternate ending to the vanilla route? The story should’ve made it clear that it’s an alternate ending where she doesn’t go back to acting. I’m having issues getting the appends to work. Seems it’s not recognizing the Patch, anyone found a solution? Thanks for the patch by the way! 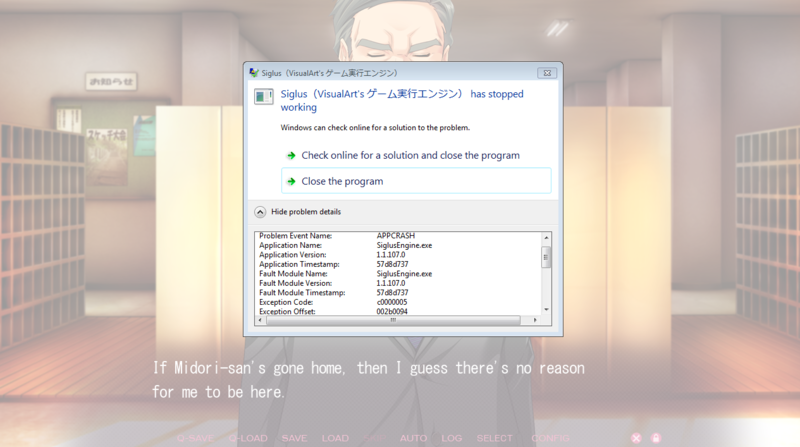 Also, I’m getting a crash in midoris route. Happens after the school festival scene where you meet kishi and midoris dad. Please post a screenshot when making these kinds of posts. We can’t help you with just “I’m getting a crash”. What is each appendix about? I mean, focus on an alternative story? Continuation? I want to know what each story is about. For example, in May’s route, it focuses on a parallel story where she is not an actress. And the other plots of the heroines? Do you have to use the launcher in the append folder or is it just already installed int the game by being in the same folder? Asking because I cannot get it to launch it from the new launcher. Do you need to replace anything in the old file? The base game works 100% fine, but it was a pain to install and idk if I want to go through that again. You guys are amazingly consistent! You’ve only done two works so far, but every time I come back to VNs you’ve done something new! Big props to you guys for that. I’m used to coming back and seeing the same ones being worked on every time. I’m getting close to the point where I can read VNs in Japanese without painful difficulty, but I’ll probably keep reading your ENG versions since they’re really good. Hey, guys. Having a little trouble setting up. Downloaded the game from DMM and extracted the patch to the root folder, replacing all files when prompted. However, when I started up the launcher, the game asked me to insert a disc (despite me obviously buying it in downloadable format). Any idea on how I can address this issue? Guys, what number of lines in Hatsukoi, Hoshiori and Ginharu? And size of text? Just interesting. Thanks! hi, are you still active group? is there any translation going on on Yukino or Tsujidou-san no Jun’ai Road? Really missed you guys. Hopefully it’s all good on your side. How many text lines in Hatsukoi 1/1, Yume Mirai and Ginharu? Thanks!